Thanks to Kat Sherbo for this guest post. Summer is in full swing, and that can mean some new hazards for our dogs. Just like we have to start thinking about sunscreen and drinking more water again, our furry pals will need similar sorts of attention or changes to their routine. Take a look at these six summer pet hazards, and how you can help your pooch avoid them. Dogs usually like to have a lower body temperature than we people do, which means that summer can be tough for them, especially in really warm climates. Be sure to keep your dog inside during the hottest parts of the day, and take them for walks in the early morning or after the sun does down. 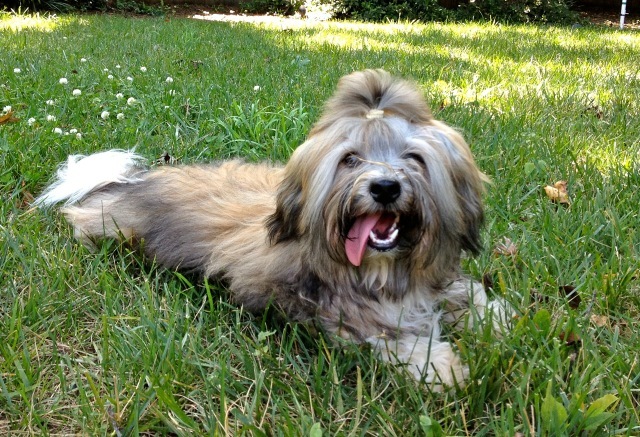 Too much heat can cause heatstroke in dogs, which can unfortunately be deadly in some cases. Dogs with short noses are called brachycephalic breeds – like Pugs and Boxers. These dogs can have a very difficult time breathing in the heat, so keep an extra-close eye on your short-snouted dog. When you do go out for a stroll, think about your pup’s paws, too. If the sidewalk is too hot for you to walk barefoot on, your dog might not like it either. 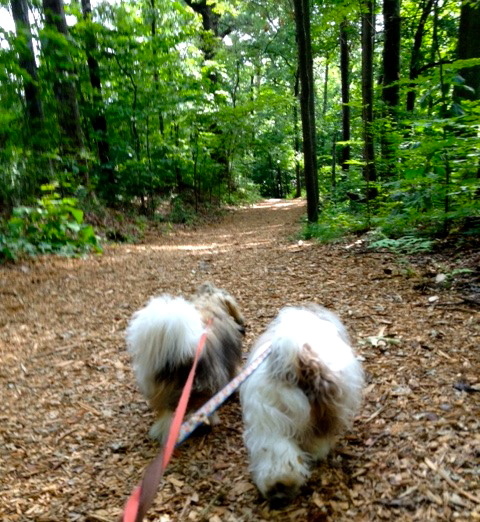 Consider a dirt path for your walk if there are any such trails nearby, or get some booties to protect your dog’s paws. Finally, beware of shaving your dog. It can seem like this would be a perfect way to keep them cooler, but some dogs, like Siberian Huskies, use their coat to regulate their body temperature in the cold and in the heat, and shaving their coat will actually cause them to overheat. And all dogs’ hair protects them from sunburn. If your dog is a breed that will benefit from a haircut, remember to be extra cautious about being in sunlight, and pack a dog-safe sunscreen for any longer jaunts. Symptoms of heatstroke are excessive panting, disorientation, increased body temperature, blood in their stool, or seizures. Any of these are a sign to get your dog inside and cooled off, and bloody stool and seizures are always reason to call your vet. 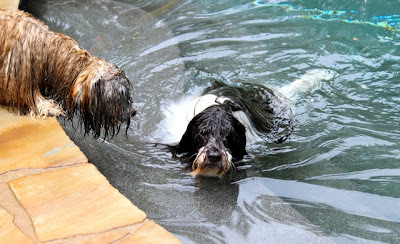 Some dogs just love to splash around and cool off, but just like with small children, dogs who slip into a pool unattended are in danger of drowning. Keep your pool fenced off and have only supervised swim sessions. These pests love the summer, and they love to bite dogs who wander by them. Fleas and ticks usually thrive in moist, shady areas, which is unfortunate, since that’s the type of place an overheated dog might seek on a long walk or hike. Make sure your pet is protected with an oral or spot-on medication, or a collar. Dealing with flea or tick borne diseases is never fun. You can also your pet when they come inside, checking for ticks especially if you live in an area with lots of tick activity. Some dogs will bolt when they hear loud and scary noises, which means they could get hit by a car or get into other danger. Think about calming remedies if your pet gets frightened by the sounds of thunder, and definitely make sure windows and doors are closed. Supervised backyard play is the only way! Summer isn't just fun outside for dogs and people; coyotes, porcupines, foxes, raccoons, and more will be out in the warmer months, and if you have a curious or very territorial dog, this could turn into a fight, even in your own backyard. Never leave your pet outside all day while you're not around (you shouldn't do this anyway, for heat reasons), and check on your pet every few minutes if they're enjoying the backyard on their own. 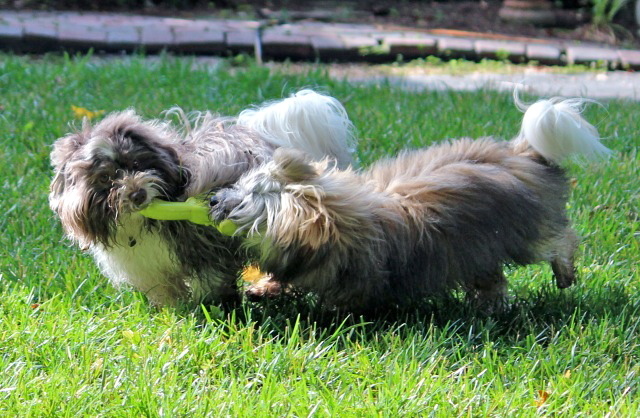 You might think your own lawn is the safest place for your dog to play, and that is true—most of the time. The fertilizers and pesticides we use on our lawns can be dangerous to pets, though. If you’re spraying your lawn or yard with any chemical products, be sure to read the label carefully and keep your pets away from any treated areas for the needed amount of time. It’s also a good idea to remove pet toys or doghouses before spraying anything. Kat Sherbo is and editor and blogger at The Wet Nose Press and PetCareRx.com. She's a Colorado native living it up in New York City, and is a lifelong dog parent. Thanks for popping in pal! The world is a scary, scary place. None of these are big hazards for my dogs - we don't have a pool, they're mostly indoors in summer, there are no pesticides or chemicals used in the yard because of the chickens. It's actually the chickens who are at risk of overheating. We have a mist system on the back patio, one taken from an old grocery store produce section. Keeps everything cool and damp. Lovely. The mist system does sound lovely! We don't use chemical in the yard either, but we are outside and out and about a lot. So we need to watch out for lots of these things! Thanks for popping by! All excellent reminders! Tick reminders are especially good. I'm not sure that we have lots of tick activity where we go but I'd rather be safe than sorry! We've already seen a few ticks here, but they hadn't attached themselves to Rocco. Flea and tick prevention is our friend here in Atlanta! Summer is rough for me being short. I don't like the heat and I get too warm super fast. I need to swim or wear my Kool Kollar to stay a bit cooler but we just try to walk early mornings and then not much the rest of the day. Ticks are also subsiding here now they were super bad in May and June. Wonderful list of things to watch out for. Wildlife seems to be a big one over here... my yard seems to be teeming with it! Thankfully, my dog hasn't run into too many problems with the critters this summer.